I would rate this card as least NM-MT or better. The edges are terrific, the image is well centered and the corners look good. The back of the card is clean. This is a great card overall! It gets even better with. 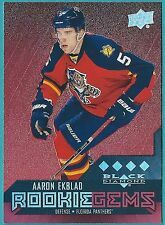 This item is a rare 2014-15 Black Diamond Card #243 of Aaron Ekblad. I would rate this card as least NM-MT or better. The edges are terrific, the image is well centered and the corners look good. The back of the card is clean. 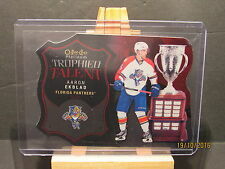 I am a collector of hockey cards and have gathered many extra cards while filling in my sets. This card is serial numbered 66 of 150. It gets even better with. 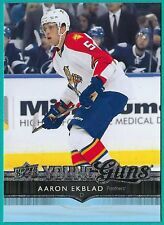 Aaron Ekblad. Nunavut (NU):--------------------------------5.00%. Red Jersey Variation Short print Card # 158. Prince Edward Island (PE):---------------15.00%. 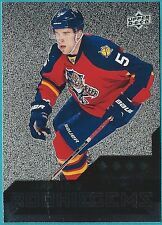 2014-15 O-Pee-Chee Platinum NHL Hockey.